ON SALE! 4 into 1 Light Socket Adapter. You can use this adapter to use 4 light bulbs in one socket. 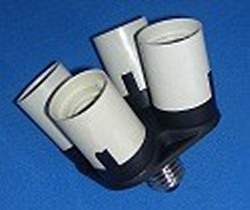 Standard Medium Base (Edison base, E26/E27) socket. Not rated for over 200 actual watts. Ie, 4 CFL or 4 LED light bulbs will be fine, but if you use incandescent lights you are limited to 4 50 watt bulbs. Great for Photography, Hydroponics, Plant Nurseries, Warehousing, etc. Spaced to fit up to 4 Par30 bulbs, CFL, LED, etc. The dramatic savings going from incandescent or CFL to LED lighting will pay for this part many times over.